Nikka Uminga is a fish-out-of-water from Manila, now living in Cebu. An interior designer and artist currently working as the head designer for furniture design prodigy, Vito Selma. 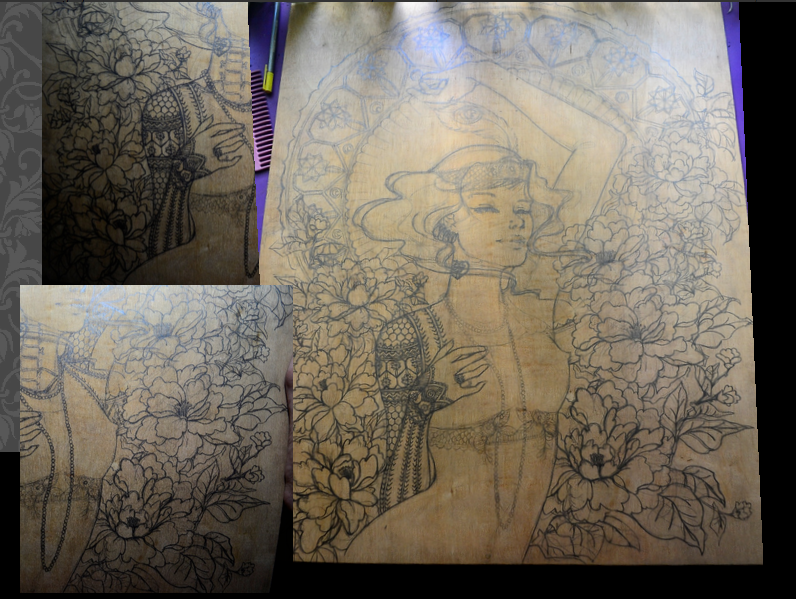 Her art style is largely inspired by art nouveau, 1920s flapper girls, flowers, pearls, and tattoos from the Kalinga province up north. 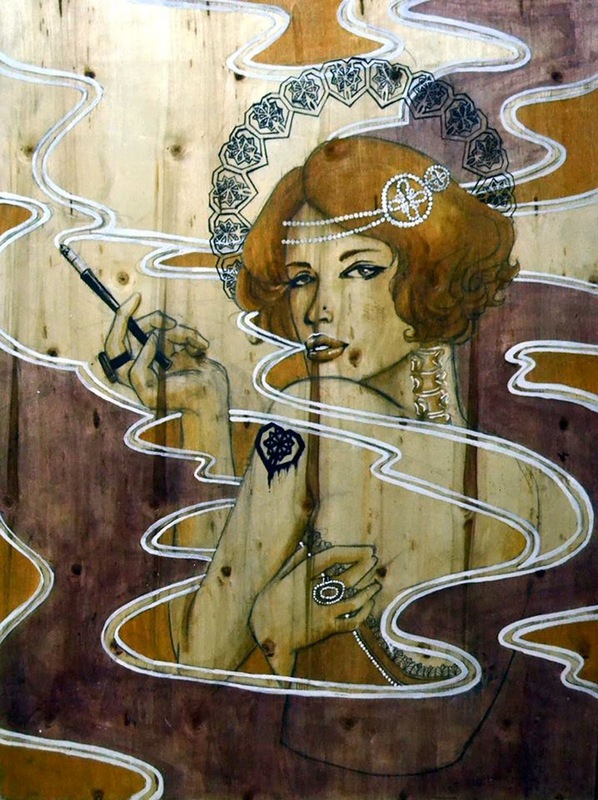 She has been participating in group exhibitions for almost three years now, and has also done a number of mural works. A myriad of artists inspire her, including Audrey Kawasaki, Nicc Balce, Alphonse Mucha, and Gustav Klimt, just to name a few. Her choice of media break away from the typical, standard fare, utilizing wood furniture finishes, such as wood oil stains, wood dyes, wood tints, and colored varnish. 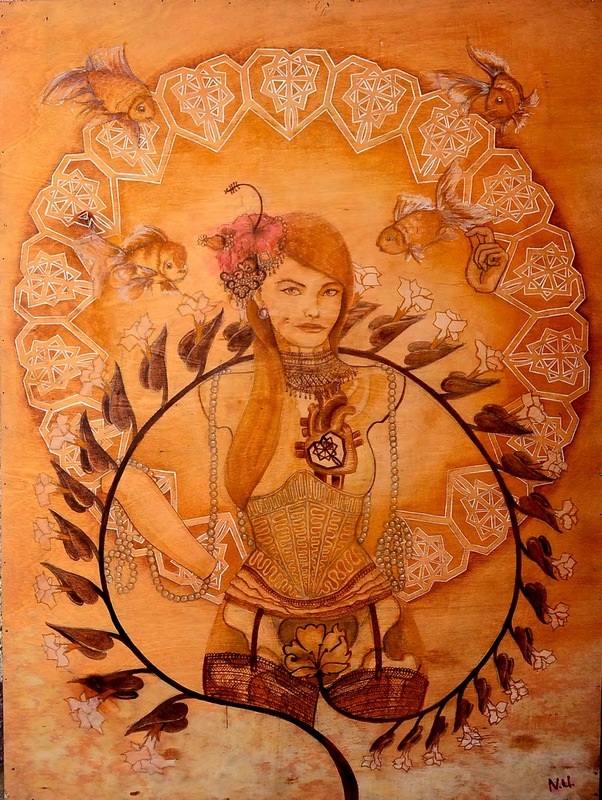 She aims for a bit of sensuality in her work, which she executes by infusing 1920s flapper fashion styles in her artwork, a bit of Art Deco sensibilities. 1. Why do you love wood as your surface or background texture image? I preferred wood as my canvas and furniture finishes to be my medium because it enhances the wood grain more and the beauty of the wood that is usually applied in furniture. I obviously love how each grain are different from another which compliment my subjects in the painting itself. 2. 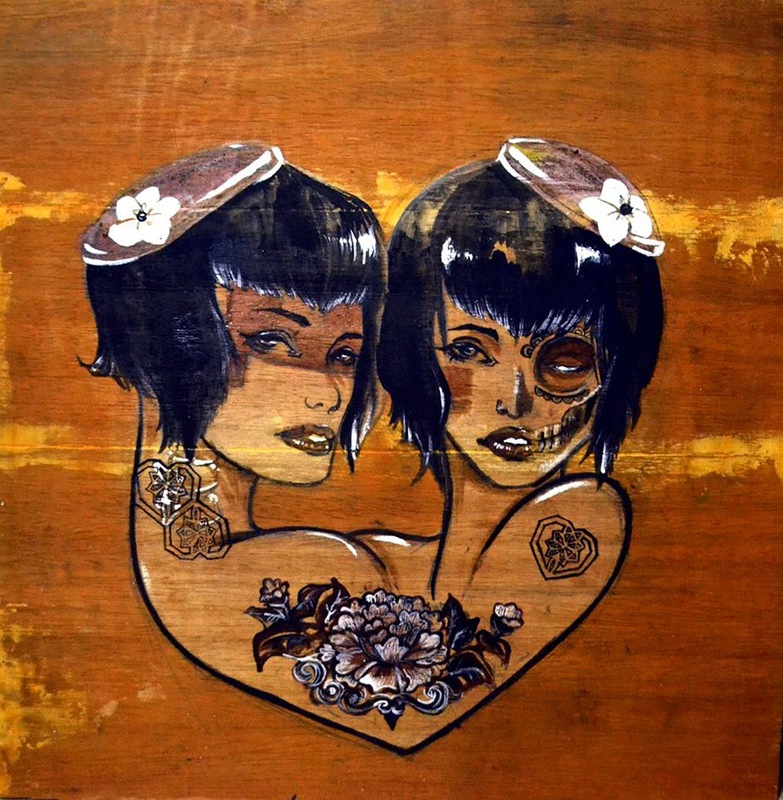 What is the difference between the Manila and Cebu art scene? Cebu scene for contemporary art has just started making its way here in the city and it is best described to be like Manila scene before who contemporary artists of today started to introduce to the audience. Cebu art are as good as Manila art but the difference is the audience to which most of the Cebuanos prefer going to Manila and buy art. That's the irony of it. But I see how Cebu artists are working hard and I can tell in time, it will be like Manila scene as well. Turquoise. Its should be blue but I think its the best color in the world for drawing. You don't need to erase but it blends with the other colors pretty well. 4. How many trees did you plant in your entire life? Back in my childhood... Lots of them. We have a farm up north in Luzon and my family worked together to plant the seedlings. My dad believes that it is worth it if you plant them and tell to your kids in the future that you did it for them. 5. 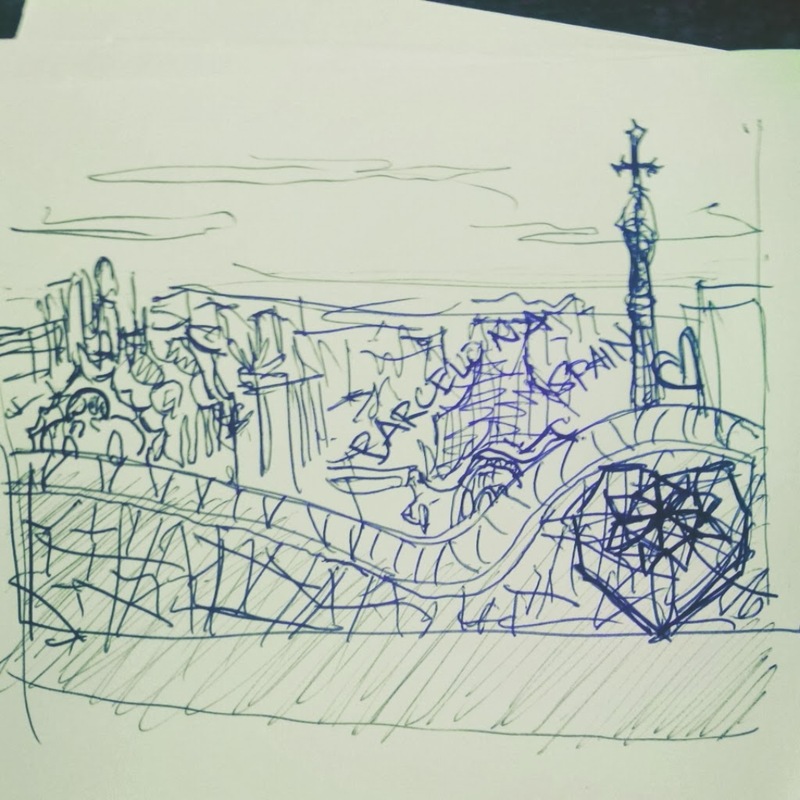 Sketch your dream place.